A matured compost heap offers a big reward this month as you dig the goodness into the vegetable plot. A compost tumbler is another, fast, way to make compost to add to the cleared vegetable beds. It’s the end of the season for half-hardy vegetables so enjoy your runner beans, courgettes, marrows and sweet corn. What’s left and you don’t want goes on the compost. When you dig the beds use a spade and leave the ground rough so the winter breaks down the soil. If your sub-soil is heavy clay then take a fork to it. If the soil is light, sandy loam then leave the digging until spring so it doesn’t lose too much moisture. Where the ground has not been dug before or for a long time, use the double digging technique. 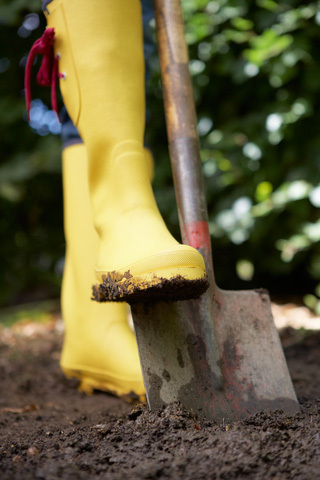 Use a spade to dig a trench one spade deep then fork the bottom to the depth of the fork. Dig the next trench and turn the soil into the first and so on until the last trench is dug and you use the soil from the first trench to fill it. Keep off the dug area until spring planting.